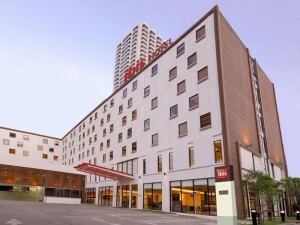 The Ibis Bangkok Nana is a comfortable three star hotel on Sukhumvit Soi 4. It’s one of the most convenient hotels in the area for visiting Nana Plaza and other nightlife along the soi. Rooms are clean, simple and comfortable, with free Wi-Fi and modern facilities. The hotel has a free shuttle to take guests to the BTS station. One of the best low-cost hotels on Soi 4.